Such was the intensity of the blast that the entire building was reduced to rubble, and reportedly also caused three houses to collapse. The explosion reportedly took place due to the crackers stored inside the building. 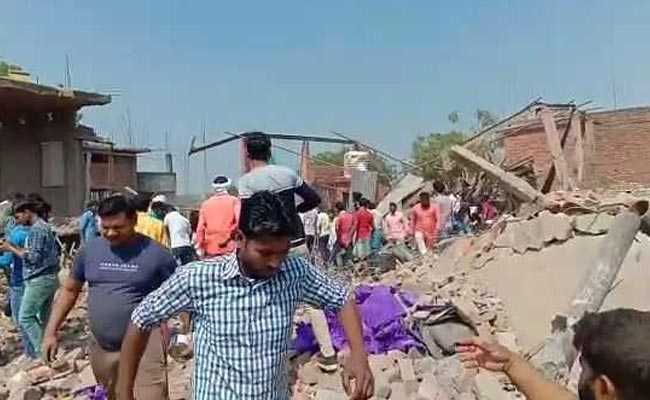 At least eleven people have died in an explosion inside a carpet factory, which was being used as a front to make crackers, in Uttar Pradesh's Bhadohi district this afternoon. The explosion reportedly took place due to the crackers that were stored inside the building. Such was the intensity of the blast that the entire building was reduced to rubble, and reportedly also caused three houses to collapse. Visuals from the blast site showed rubble scattered everywhere. West Bengal Chief Minister Mamata Banerjee on Twitter expressed condolences to the families of people killed in the blast. She said nine people killed in the blast were from Malda. "Bengal ministers Shuvendu and Firhad with others on their way to Malda," Ms Banerjee said. Rajasthan Chief Minister Ashok Gehlot also tweeted about the blast. Sad to learn about the explosion in #Bhadohi, #UttarPradesh in which many people have lost their lives and several have been injured. My condolences to the families of victims, may god give them strength to bear this loss. I pray for early recovery of injured. Earthmoving equipment was pressed into service to carry out relief and rescue works, news agency PTI reported. Forensic experts and a team of the National Disaster Response Force (NDRF) reached the site soon after the explosion. "When the blast happened, there were a few workers at the carpet factory where crackers were also manufactured illegally. It is unlikely that more people are trapped inside," Piyush Shrivastava, IG, Varanasi said. "No one has filed a complaint in this regard," he added.